The Connecticut General Assembly is now in session with the various legislative committees starting to process bills. Public hearings are being held on a regular basis concerning these bills. So far the State Grange has testified on three different bills. The first was Proposed Bill No. 518, An Act Concerning Driving With A Pet On The Drivers Lap. We testified on this bill in response to a resolution that the delegates passed at the last State Grange session supporting restriction of pets on laps. Our delegates expressed concern that drivers are distracted by these animals and about the safety of the animals. Our testimony was noticed by some of the press in attendance and the Connecticut State Grange was mentioned in various papers and radio news agencies mentioning our support of this bill. The press also noted our support for pet restraints in vehicles. The second bill testified on was Proposed Bill No. 346, An Act Concerning The Farmland Restoration and Vacant Land Programs of the Department of Agriculture. This bill would allow the Department of Agriculture to prepare restoration plans which are required by the Natural Resources and Conservation Service of the US Department of Agriculture. This would set the foundation for the state to apply for federal grants to assist with the costs of restoring some of Connecticut’s farmlands into productive land. The Grange also supported Proposed Bill No. 6731, An Act Concerning the Treatment of Certain Farmland for Purposes of the Estate Tax. This bill would exempt land classified under the “490” program from being included in a decedents assets. This would reduce the inheritance tax the survivors would need to pay. Presently many families are forced to sell some of the land in order to pay these taxes. This bill would help preserve this valuable land. 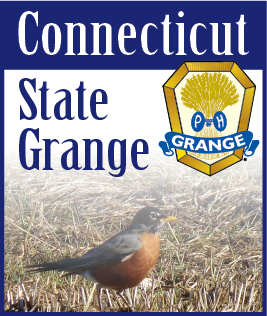 All of the testimonies have been placed on the Connecticut State Grange web page www.ctstategrange.org. Any future testimonies will also be placed there as well. The Governor has also just released his proposed budget for the next two years. One of the proposals is to cut $13.5 million from the Community Investment Act. This is where much of the funding comes from for land preservation. The Governor is proposing increasing funds for the States lagging transportation infrastructure. There have been rumors of reinstating tolls to help raise revenue for this. He also proposed decreasing the sales tax to 6.20% but wants to eliminate the tax exemption on clothing and shoes under $50.00. One big hit to the small towns is the elimination of subsidies to assist with the costs of having resident state troopers. The budget will be a work in progress for the next few months with both sides pulling it apart and hopefully coming up with a budget before the end of the session.